Successfully advertising in today’s market is a challenge. Everywhere you look there is some new campaign that pushes the boundaries of advertising. 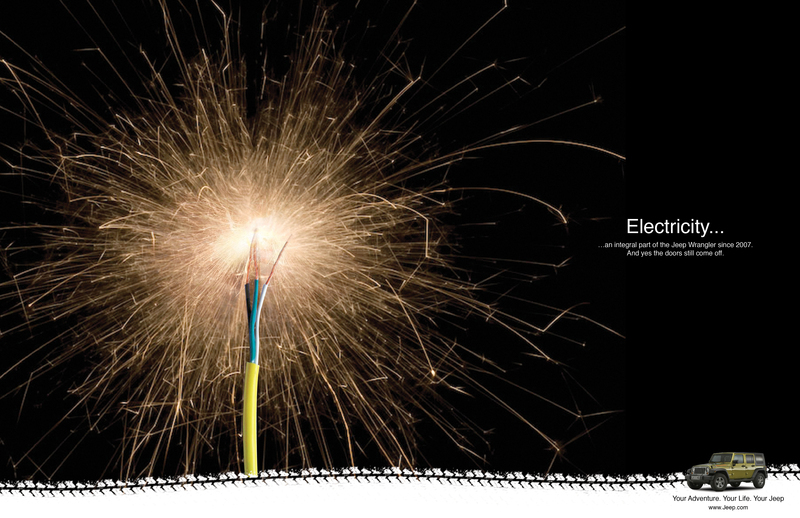 Wether its clever, funny, or controversial, these ads stay with you and get you talking. This is exactly what makes a successful advertising campaign. However, this isn’t easy. For every good advertisement you see, there are 10 bad ones. There is a science behind good advertising and in this article I will show you how I designed my advertising campaign for Jeep during my senior thesis. This is just the tip of the iceberg that is advertising. I won’t cover all the techniques I used in this article but in the future I might write another list if this is popular enough. Before you begin messing around with images and headlines you need to have a solid strategy. You cant go into a campaign blind and expect to have a solid outcome. Before I even started designing my advertisements I planned a strong strategy. Research, research, research! You need to understand what you are trying to sell before you start selling it. I created a 115 page thesis book about Jeep, so I understood exactly what I was trying to sell (this might be a little extreme, but you get the idea). You also need to know who is the target market, who would you want to sell your product to? I wouldn’t be advertising Jeeps in a magazine target to “going green” because that isn’t Jeeps image. Also, you need to know how your product can stand out and beat its competitors in the marketplace. If the strategy isn’t defining the client and setting them apart, the creative probably won’t do it either. After you have a solid strategy, you need to find out what your approach is going to be. This is the part when you decide if you are going to sell a feature, category, or benefit of the product. You can also chose to sell the image, lifestyle, and attitude of the brand. A brand like Audi never used to be known to be as high class as Mercedes or BMW, but thanks to their new approach at advertising, their position shows the lifestyle of the brand. Now they are known to be among the elite car brands. Entire ad campaigns are based around the position that is chosen. This is why it is so important to have a solid strategy and the right approach. These are the two fundamental principles to follow when creating any ad campaign. There is no formula on creating an effective headline. Everyone thinks differently so for some people they might not be able to come up with a headline at all, for others it might come to them with ease. A headline should emphasize ONE idea. Many people make the mistake to include too much in their headline. The headline should also compliment the imagery and visa versa, but never show the same thing. You wouldn’t have an ad about dog food and then have the headline describe that it’s dog food, we already know that. A good headline might have one sentence that undersells the product, or even have just one word. You can also overstate the product. By using a hyperbole, you are obviously overstating and getting attention, maybe even a laugh. Some other techniques would be to use commands and punctuation. By using a command and punctuation the ad is calling you out, its talking to you and it has a sense of authority. Readers pick up on this because it stands out. By combining a few techniques you can create a really effective ad. 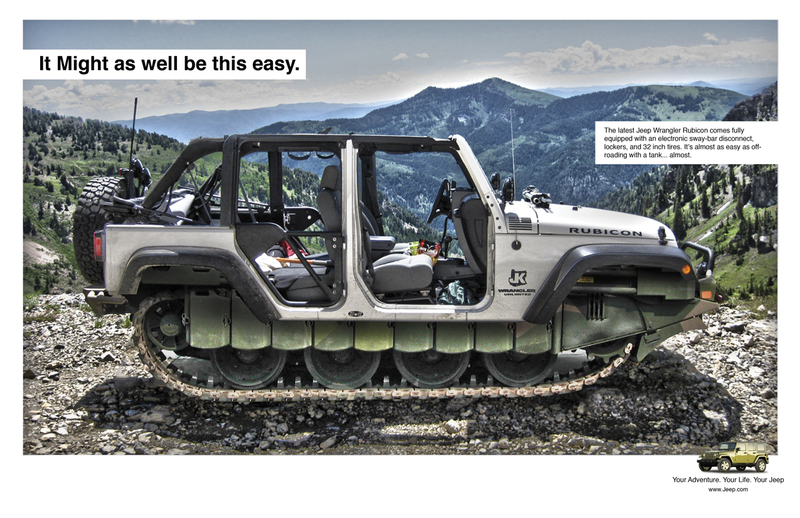 I combined a short headline, punctuation, and saying the obvious (but not so obvious) in a Jeep ad. The obvious is that the Jeep comes fully equipped with electricity, the not so obvious is that electricity (such as power windows and locks) is a newly found feature in Jeep Wranglers (2007). The body copy of an ad is extremely important. If the readers actually like your visuals and read your headline then they have made it pretty far. Once they start reading the body copy you are lucky. This is why it is so important, you have their attention, so make it worth their while! I chose to have a tongue-in-cheek ad digging at hybrids but showing the capability of a Jeep. The tone, style, and voice of the copy is important in selling your ad. You wouldn’t want dark, sarcastic copy for something that is playful and fun. The headline and body copy need to have the same style. 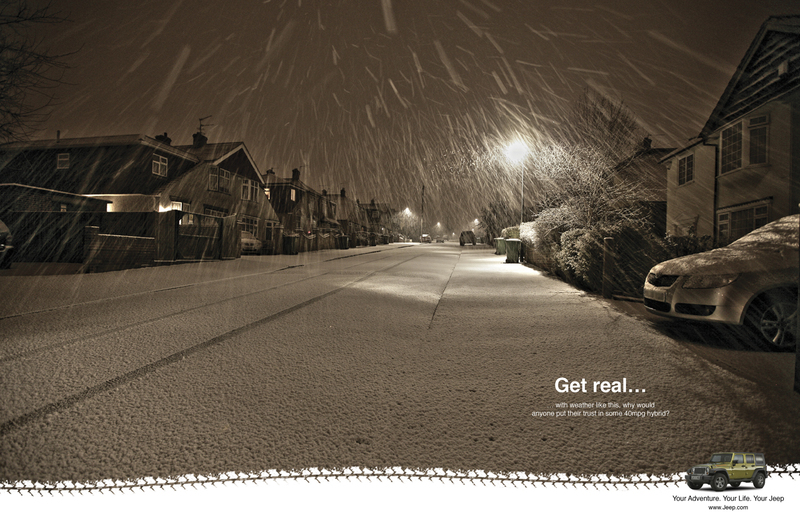 With my “Get real” ads I showed a clever headline, then I followed up with witty body copy. There are many options on how to pick your “voice” for the ad. You can be a representative of the company, telling you the details and facts. You could also become a customer, designing the ad the way your customers would. Maybe you might choose to write in third or first person? Maybe use the power of a testimonial. The particular style and even choice of words and details can come straight from all the research you did in the beginning stages. By selecting certain aspects of the company, you can highlight important points in an advertisement. Maybe you found out that your company was the first to create something, use that. There are way too many tips to include in one blog post, so this is an extremely brief overview that should get you well on your way in creating a successful advertisement. Depending on your strategy and approach, your headlines and body copy may come out completely different from ad campaign to ad campaign. 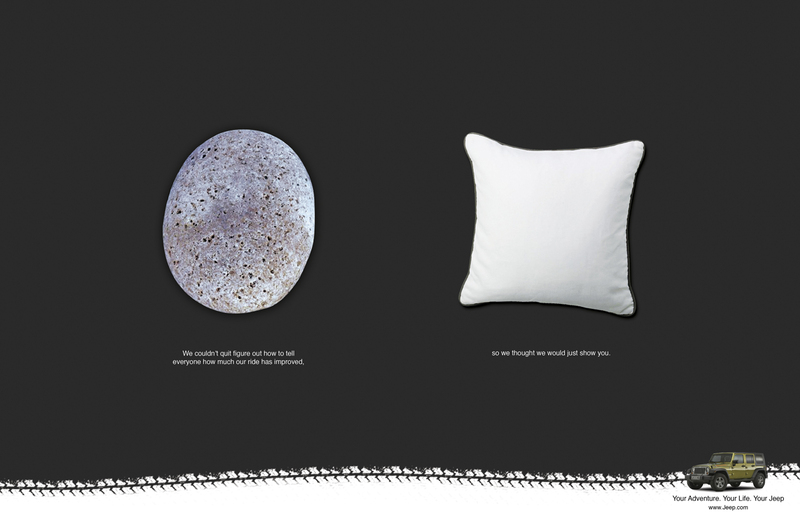 One campaign might rely on being witty or fun, the other ad might be straight forward and full of details. Each situation will be different and it should all reflect the brand. I created around 15 advertisements for my Jeep campaign and each one I wanted to be unique. I used all of these strategic approaches as well as many more during their creation. Each example I showed above uses other techniques that I did not describe, but if you are truly interested in designing ads, I highly recommend picking up Advertising Concept and Copy by George Felton. I learned a lot from this book as well as some of my other classes and most of what I said can be found in it. I didn’t really touch on the imagery in this post, so next week I will dedicate a post to the importance of imagery and what to do and not to do. Do any of you use these techniques when creating an ad?